1. Heat 1 tbsp oil in a medium saucepan over a high heat. Add most of the salad onions, and fry for 1 minute. Stir in the garlic and spelt, and cook for 1 minute. Add the wine, and cook until it all evaporates. Then pour in the stock. Cover, bring to the boil and simmer for 20 minutes. 2. Add the asparagus stems, then simmer for 5 minutes uncovered, until the spelt and stems are tender and the stock has been absorbed. Stir in most of the cheese, and remove from the heat. 3. Meanwhile, heat a frying pan until very hot. Toss the asparagus tips with 1 tsp oil, season, then cook for 5 minutes, until just tender. 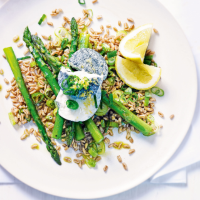 Season the spelt, then serve topped with the asparagus tips, reserved salad onions, remaining cheese, finely grated lemon zest and a squeeze of lemon juice, to taste.